With nearly 7 million new Android phones and iPhones activated on Christmas Day, an app-downloading frenzy was a foregone conclusion. App research firm Flurry estimates that a combined total of 1.2 billion apps were downloaded during the holiday week between December 25-31. That compares to an average of 750,000 mobile apps downloaded per week earlier in December, or a 60 percent jump. This is the first time app downloads surpassed the one-billion mark in a single week. 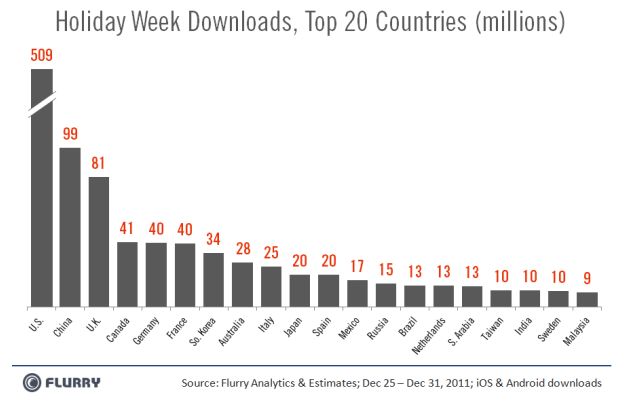 About little less than a quarter of those apps (242 million) were downloaded on Christmas Day itself. People download a bunch of apps when they first activate their phones, and then add more as they discover new apps. But that first week the downloading activity is at a height while consumers are still eager to play their new toys. The geographic breakdown is also notable, with the U.S> accounting for nearly half of all downloads (509 million), followed by China (99 million), and the UK (81 million). Then Canada, Germany, and France all came in at around 49 million.